The giant armadillo (Priodontes maximus, Kerr, 1792) is vulnerable, said the latest study presented in the Red Book of vertebrate wildlife of Bolivia as assessed by 2008. This animal would’ve been sacrificed as a result of floods in the lowlands of northern La Paz and Beni. 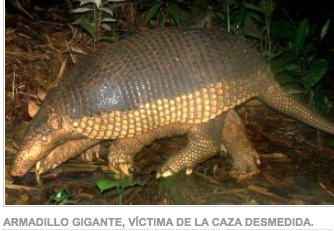 Susana Carpio, head of Animales SOS, told El Diario that it became known through social networks, the sacrifice of the giant armadillo, but nevertheless the same reference had no origin on the source nor on how updated it was. This animal, according to the Red Book, this Bolivian wildlife vertebrate is the largest living specie of armadillo, with a length of 750-thousand millimeters; 500-550 millimeters long tail; 180-190 millimeters long leg, ear 47-59 mm and a weight of 30 kilograms for adults. “It is endemic to South America and distributed just east of the Andes. From northern Venezuela and southern Guyana to southern Paraguay and northern Argentina; in Bolivia is a widespread species, found in the departments of Beni, Cochabamba, La Paz, Pando and Santa Cruz “, says the text. According to Carpio, the main threat to this species is hunting, mostly subsistence of the inhabitants of those regions, which is beyond the control that should be exercised according to the 1333 Act that protects wildlife animals. (Chapter VI of the Flora and Fauna). The document prepared by Conservation International says about that major threats to the armadillo is hunting for subsistence and habitat destruction. “Its large size makes favorite prey for hunters and it is widely spice armadillo hunted by indigenous groups as Siriono, Ayoreo Chiquitano, Tsimane and Tacana”. Regarding conservation measures, the document states that “there is a need in the country and other countries in South America to reduce hunting pressure and preserve their habitat to allow survival of viable populations”. For this suggests that entities called by law to conduct studies to determine the population status of this species in the country “and urges that work on a strategy for this species and other species of armadillos in the country”.